Produces magnification within 20 - 300x range. Equipped with 3.5" color LCD display and a 5 Mpx digital camera. The microscope features 8 built-in LEDs with brightness adjustment, allowing you to set desired level of illumination, and a measuring scale (8 cm along the x-axis, 6 cm along the y-axis). 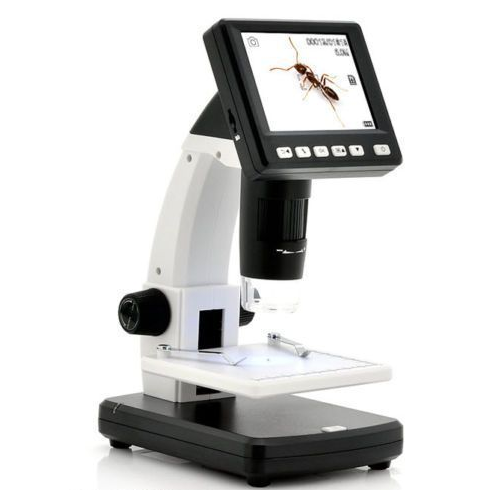 One of the main advantages of this model is that you can observe without connecting the microscope to a PC, since it features a built-in 3.5" LCD display, making it truly portable and independent. When not connected to a PC, the microscope is powered by a Li-ion rechargeable battery (included) providing for 2 hrs of work. Images and videos obtained during your observations are saved to a microSD card. Produced images may also be easily transferred to a PC monitor or even a TV screen (USB and AV cables are included). When connected to a PC, the microscope is powered via USB port. Please launch the installed software only when your microscope is connected to a PC and ready for observations.